This week's tablehopper: time to party. Just GUESS how I felt about these colors! (Hot pink and green is totally my jam right now.) 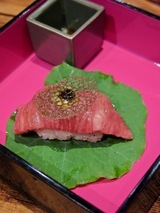 This is the rich A5 tri-tip tataki nigiri with a squid ink tuile on the latest tasting menu at Hitachino Beer & Wagyu. Photo: © tablehopper.com. I celebrated the mymilligram launch last week with a gorgeous Friday night LCD Soundsystem show at the Greek, what a night! Felt good to get up from this damn desk and go shake it. If you’re here after a little break and wondering why tablehopper is every other week now, here’s the update for ya. I’ve still been doing a ton of food writing: I have my new weekly column at Bay Area Bites on Mondays called Table Talk, which you won’t want to miss. This Monday’s column includes the new meat-and-three menu at Town Hall, my fave hefty deli sandwiches at Limoncello, plus a special guest tempura chef from Japan is going to be cooking at Hitachino Beer & Wagyu May 14th-15th, and there’s a great new happy hour at Lord Stanley, plus a fun Kentucky Derby party at Comstock Saloon! The prior week’s Table Talk included a look at the swanky new The Beehive, the sad closure of Katia’s (open since 1994, the year I moved to SF! ), and did you know you can get steaks from Olivier’s Butchery on the menu at Café de la Presse? Now you know. I’ll be posting my weekly Table Talk column on the tablehopper Twitter and Facebook channels, so you can keep up with weekly news I (mostly) won’t be covering here in tablehopper. There’s just too much to write, I swear. We are in the home stretch for ticket sales for this Thursday’s tablehopper preopening party for Donato Scotti’s Cento Osteria on the Embarcadero. It’s going to be a lively evening of Aperol Spritzes, Boulevardiers, Negronis (and Sbagliatos! ), wine, wood-fired pizzas, stuffed pastas, antipasti, salumi, roasted suckling pig, vegetable sides, and plenty of fun tablehopper party people. Just $50, people! And we’re making a donation to Family House—the more tickets we sell, the bigger the donation, so grazie! Another article for you: I wrote this post for Blackboard Eats a few weeks ago on some of the best Southern cooking in SF. Lastly, I was posting this interesting Munchies article on social media about the man behind Meyer lemons, check it out, it’s a great read. Aperitivo time means Aperol Spritzes and Negroni Sbagliatos. Photo: Ryan Robles PR. Thursday is your time to get up close and personal with some Cento Osteria pizza. Photo: Nadia Andreini. There will be all kinds of pizzas coming out of the wood-fired oven! Photo: Nadia Andreini. Donato Scotti knows a thing or two about stuffed pasta, especially casonsei from his native Bergamo! Photo: Nadia Andreini. 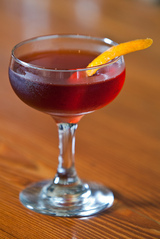 Thanks to Campari America, we’ll be pouring one of my very favorite cocktails, the Boulevardier. Photo courtesy of Campari America. Did you get your ticket yet? No? You don’t want to hang out over aperitivi, cocktails, salumi, roast pig, pasta, and wine for just $50? Whatsamatta wit you? Tutti a tavola a mangiare! A few weeks ago, I shared the latest details about Donato Scotti’s (of Donato Enoteca and CRU in Redwood City and Donato & Co. in Berkeley) first SF restaurant coming to the Embarcadero, ~CENTO OSTERIA~, and we get to be the first ones in! We’re hosting a preopening apericena party this Thursday May 3rd, and it’s going to be a blast. You’ll be the first to taste some dishes off the upcoming Cento Osteria menu, which is all about highlighting dishes from the different regions and provinces of Italy. You’ll get to taste housemade pasta (like Donato’s famed casonsei, a pasta from his native Bergamo stuffed with sausage, pancetta, amaretto crumbs, Grana Padano, and garlic) to a variety of pizzas from the wood-fired pizza oven and roasted suckling pig! There will also be salumi, assorted antipasti, and vegetable dishes aplenty. You’ll get to experience apericena, a trending style of eating in Italy: a dinner (cena) comprised of antipasti and ample bites and small plates (which is what you find during aperitivo time). It’s one of my favorite ways to eat, and it’s something Donato will be encouraging and bringing to life at Cento Osteria, especially since they have that full bar. Consider this your first apericena! You may have an Italian accent by the end of the evening (if you don’t already)! To accompany all those tasty bites at the party, we’ll also be offering cocktails (courtesy of our generous sponsor Campari America), including Aperol Spritzes, Boulevardiers (my favorite! ), Negronis, and Sbagliatos, as well as pouring some wines (prosecco, white, rosé, and red). Your $50 ticket includes three drink tickets! We’ll be making a donation to our charity partner for the evening, Family House, which serves as a home away from home for families of children with cancer and other life-threatening illnesses by providing physical comfort and emotional support, free from financial concerns. So the more tickets we sell, the more we can donate. Please come! Tickets are only $50 (plus a small ticket service fee), which will get you three drink tickets and access to all the delicious food! (Additional cocktails/wine will be available at a very affordable price.) And a donation will be made to charity partner Family House. The party will run from 6pm-9pm. 21+ only. Get your tickets now, we don’t have many left! See you this Thursday May 3rd! Festeggiamo! Mangiamo! Beviamo! Pim Techamuanvivit (photo via Facebook). Big news: Bangkok native and chef-owner Pim Techamuanvivit (~KIN KHAO~) has been named chef at Bangkok’s ~NAHM~, an extraordinary restaurant I enjoyed immensely during my visit to Thailand last year. (The restaurant first opened in London, and then inside the COMO Metropolitan Bangkok; chef David Thompson, an Aussie, is moving on to “focus on his global food business Aylmer Aaharn”). Today’s New York Times piece mentions Pim “plans to split her time between the two cities and the two restaurants, though she isn’t sure of her exact schedule; she has been in Bangkok for just over a week.” She’s going to be touring farms in the north and connecting with producers, and plans to renovate the kitchen, which will close the restaurant temporarily before it reopens with her menu, updates, and more. Congrats on this amazing news, Pim! Starting on Cinco de Mayo, the cocktails will be flowin’ at Papi Rico. Photo: Connor Bruce Photography. An array of beachy bites at Papi Rico. Photo: Connor Bruce Photography. Opening just in time for a soft opening on Cinco de Mayo is ~PAPI RICO~, a Puerto Vallarta-inspired cantina in the Castro (in the former Dante’s Table). Owners Rick Hamer and Bill Vastardis (Finn Town) will be bringing beachy vibes in the food and cocktails, as well as a party atmosphere. There’s a main dining area, a semiprivate Gecko Lounge (for large groups or private parties), and a lush backyard patio with a living wall, tropical plants, and three magnetic murals (all commissioned by Papi Rico from different artists). The cocktail menu (from lead bartender R.M. Richards of Finn Town) features tequila- and mezcal-based drinks that take their names from beaches, towns, and landmarks of P.V., including the Playas Conchas (tequila, lime, grapefruit bitters) and the Sayulita (sotol, pineapple, hibiscus), and some frozen drinks, of course. The snacky menu is like what you’d find at beachside stands, like ceviche de pescado, cheese empanadas, and your choice of tacos, tostadas, or quesadillas with steak, chicken, carnitas, fish, vegetables, or al pastor. Open Mon-Fri 4pm-1:30am, Sat-Sun 11am-1:30am; note the kitchen closes at 11pm, outside patio closes at 10pm. 544 Castro St. at 19th St. The new Hayes Valley Bakeworks on Golden Gate Ave. Photo courtesy of Mark Bailey/Bakeworks. Powder’s boozy Tropical Flight. Photo: Albert Law. 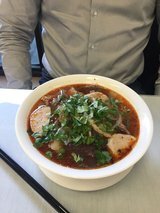 Bun bo Hue at the new Rose Kitchen. Yelp photo by Genevieve Y. This latest Bakeworks location will offer morning pastries, soups, salads and sandwiches, and all-day cookies/bars, including many gluten-free and vegan offerings (office meal catering is also available). Drinks include locally roasted hot and iced coffees and teas along with fresh-squeezed juices and more. Jim Maxwell of Architects II designed this space as well. 525 Golden Gate Ave. at Polk. Another sequel: ~POWDER~, the makers of the tasty Taiwanese shaved snow on Divisadero, Mimi Hanley and David Chung, have opened a second location at Mission Bay’s Spark Social SF. You’ll find their signature flavors like black sesame, horchata, and matcha green tea, waffle bowls, and new additions like boozy snow (you can try all three—passion fruit mojito, piña colada, and strawberry daquiri—in a tropical flight during happy hour Mon-Fri 4pm-7pm for just $7). Open Mon-Sat 11am-9pm and Sun 11am-5pm. 601 Mission Bay Blvd. North at 4th St.
Looks like the ~GRILLED CHEEZ GUY~ got his brick-and-mortar location open! Be sure to follow him to find out when he’s giving away free grilled cheese sandwiches each month! Soft opening hours: Mon-Fri 11am-4pm. 529 Stevenson St. at 6th St.
Eater first reported about a new Nepalese restaurant taking over the former Babu Ji space on Valencia, ~DANCING YAK~, and it’s now open. Check the menu here (some of the dishes sound really awesome, like roasted soybeans, crunchy beaten rice, garlic, ginger, and chile—sign me up! ), and you can enjoy cocktails too. Open daily 11:30am-10pm. 280 Valencia St. at 14th St. I was so sad that ~BODEGA BISTRO~ closed, and with the death of former chef Jimmie Kwok not too long ago, man, I guess it’s time for a fresh start over there. Sigh. Hoodline noticed there’s a new Vietnamese restaurant that has opened in Bodega’s place, ~ROSE KITCHEN~, and according to their note on Yelp, “We specialize in Vietnamese authentic food, bun bo Hue (spicy beef noodle soup), banh canh cua (Vietnamese thick crab soup), mi vit tim (duck leg stew with Chinese herb broth), bun cha Ha Noi (Northern-style grilled pork patties in sweet and sour fish sauce with vermicelli)”—I say yes to all of that. Open daily 10am-11pm. 607 Larkin St. at Eddy. More noodles: Hoodline’s intrepid tipster Al M. noticed Ramen Underground has opened a new udon spot, ~UDON UNDERGROUND~, in the former Kisu Japanese Cuisine in the FiDi. They reportedly are serving six different udon variations with udon imported from Japan. 493 Pine St. at Belden. This came rolling in at the last minute, but there’s a new gaming café that just opened in the Inner Sunset called ~THE GAME PARLOUR~. I kind of love this. They have hundreds of board games you can play, and it’s just $5 per game (for as long as you want) unless you order food, and then it’s free. The menu includes mochi waffles, savory waffle sandwiches, waffle-cut fries, Three Twins ice cream, and gourmet popcorn, plus a full specialty coffee and espresso bar featuring Ritual Coffee to keep you wired, a soda fountain, and milkshakes. Soft opening hours: Sun-Thu 11am-11pm and Fri-Sat 11am-1am. 1342 Irving St. at 15th Ave. The crispy chicken karaage sandwich. Photo courtesy of Kahnfections. MUTEK.SF is not just about beats. It’s also bi-valves. Photo courtesy of MUTEK. Happy Birthday to ~KAHNFECTIONS~, celebrating their first year in the Mission with the introduction of a crispy chicken karaage sandwich, served on one of their amazing fresh biscuits with wasabi furikake, wasabi aioli, and Japanese pickled vegetables. 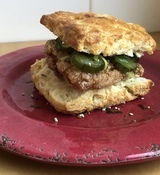 On the weekend of May 4th-6th, 100 percent of the proceeds from the purchase of the new sandwich (as well as any other biscuit sandwich or biscuit purchase) will go to Support for Families. Check your sandwich packaging for some Willy Wonka-style presents ($10 gift cards!). And then the karaage sandwich will continue to be served on Fridays only. Open Mon-Fri 6am-3pm and Sat-Sun 8am-3pm. 3321 20th St. at Folsom. Fellow lovers of music and food: the MUTEK festival is premiering in the U.S. (and San Francisco!) for the first time, and they lined up some pretty cool food programming too. It runs Thursday May 3rd-Sunday May 6th. MUTEK.SF is co-hosting pop-ups with Feastly, and as a passholder, you receive exclusive access to reserved seats for these dinners: use password EatMUTEK (case sensitive) when booking your seats. MUTEK.SF passport holders also get access to some reservations at top restaurants (Octavia, Rintaro, Montesacro Pinseria, Kin Khao, and others). Call the reservation line: 415-997-9054. And then on Sunday May 6th at The Midway, Preeti Mistry is hosting a Juhu Beach Club revival! Some of her most beloved dishes will return just for one day! The early-bird brunch special (12pm-2pm) includes a special brunch pizza with chai bacon and eggs—that will get me out of bed. Presale $20 tickets get you a brunch pizza, fried cauliflower/wings or salad, coffee, and a drink ticket (a $30-plus value)—you also have to have an Experience ticket for the day/evening at The Midway to attend. Brunch closes at 2pm, so you must arrive beforehand to take advantage of this offer. There will also be food available all day, from the Bollywood Baller lamb/beef meatball slider to Love Veggie Indian Pizza (eggplant crush, asparagus, fava leaves, paneer). tablehopper readers also get a 25 percent discount on a four-day passport, Nocturne 2 this Friday May 4th (incredible lineup at Mezzanine, including the West Coast premiere of Mexico’s Debit, part of NAAFI from Mexico City! ), and Nocturne 3, for the techno lovers, on Saturday May 5th. The cheerful and colorful dining room at Dyafa. Photo: Connor Bruce. An array of dishes at Dyafa. Photo: Connor Bruce. A couple of weeks ago, I wrote that Reem Assil (of Reem’s California) had opened ~DYAFA~ for lunch service in the former Haven at Jack London Square in Oakland, and now dinner has launched. You can survey the menu, which also includes cocktails, wine (riesling flights! ), and beer selected by beverage director Aaron Paul. Lunch is served Tue-Fri 11am-2pm and dinner is 5:30pm-10pm. 44 Webster St. at Water, Oakland, 510-250-9491. Also in the neighborhood, the Chron reports that the former Jack’s Oyster Bar & Fish House is going to become ~FARMHOUSE OAKLAND~, a Thai restaurant from the team behind SF’s popular Farmhouse Kitchen and Montclair’s Daughter Thai. Stand by for more. 336 Water St., Jack London Square, Oakland. Great news (in case you missed it): Oakland restaurant owner Charlie Hallowell (who was accused of sexual harassment by more than 30 employees at his restaurants) and his business partner, Richard Weinstein, have sold ~BOOT AND SHOE SERVICE~ to a former employee, Jen Cremer, and her husband Richard Clark. According to the piece in the Scoop, they will continue to keep the menu, recipes, and staff the same. So that’s one Hallowell establishment you can feel better about supporting. And now for some bad news: was sorry to hear ~POMPETTE~ has closed (via Nosh) in Berkeley (in the former Café Rouge space). 1782 4th St. at Delaware, Berkeley. Come join Cadillac Bar & Grill for San Francisco’s biggest Cinco de Mayo celebration Friday May 4th AND Saturday May 5th! Our third annual Cinco de Mayo will be one you won’t want to miss! We will have our favorite Tex-Mex dishes, a fully stocked bar with drink specials, a free photo booth, and free entry all night long! Call us at 415-554-0181 or email for more information. We’re located at 44 9th St. in San Francisco, on the ground floor of the Twitter building. Follow us on Facebook, Instagram, and Twitter, too! As if the hype machine wasn’t already on blast for ~CHE FICO~ in Nopa, and then ~Gwyneth Paltrow~ goes in for dinner and dials it PAST 11. And then she was back in SF again, dining at ~CALA~ on Sunday night and indulging in one of my favorites, the charred sweet potato with bone marrow salsa negra (!) and housemade tortillas. Iconic James Beard award-winning Italian restaurant in the Mission is looking for an executive chef. The job requires you to oversee kitchen operations for a 70-seat Italian restaurant serving dinner 7 nights, plus a high-volume pizzeria next door serving 6 lunches, 7 dinners, and a high volume of takeout. We are a full-service restaurant and bar that strives for excellence. We are a 10-barrel brewery with great food and an even better clientele. If you are experienced and looking for a great job, please apply. Seeking full-time servers and hosts with open availability, must be able to work days, nights, and weekends. Servers and hosts with an established track record.